I love that moment when you stumble across something truly unique and beautiful. 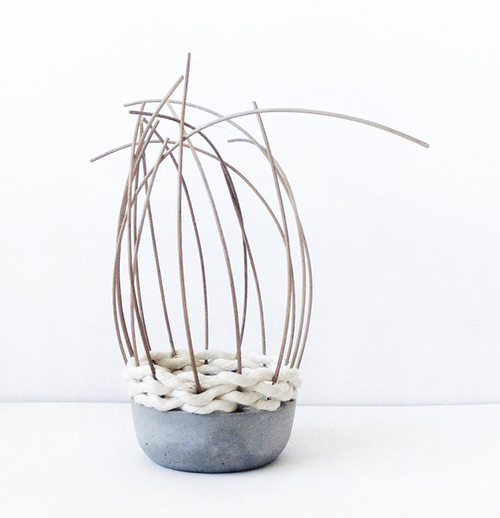 Such was the case when I clicked on the Thrive and Prosper site to find Cicely Siller's stunning concrete and reed baskets. Raised in the Netherlands and Germany, Cicely now calls Cameron, North Carolina her home. As she wanted to create something that celebrated her new, local community, she found inspiration through North Carolina's storied history of basket weaving. As she lives nearby a basket weaving supply house, she paired that idea with her love of concrete to create a myriad of beautiful conversation pieces. From crafting the mold and mixing and pouring concrete to weaving and adding texture to each piece, Cicely's process is a true labor of love. But well worth it. For one, Cicely is an artist influenced by both Scandinavian and German design, who is also inspired by southern basket weavers- so her work is wholly, uniquely her own. Plus, how can you not love any piece of art with a southern twist? See Cicely's entire concrete and reed basket collection, here.